With many different departments working together here at The Conservation Center, we understand the value of teamwork. On certain occasions, this means working hand in hand with other companies and specialists to develop the correct treatment approach for a unique piece. 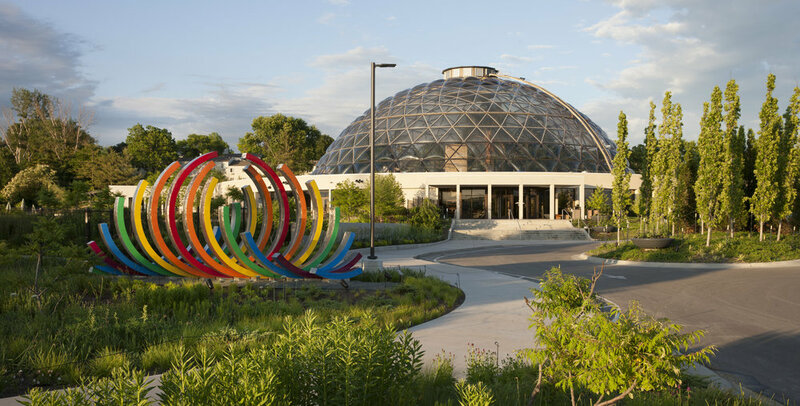 When we received a call regarding a large public sculpture at the Greater Des Moines Botanical Garden that had been struck by a car, we knew right away that engaging some trusted colleagues and specialists to assist our team with the repairs may be necessary. The sculpture, titled “Spectral Liberation”, consisted of 14 concave arcs of variable heights, which were hollow and composed of welded stainless steel. Each arc was painted with a different color, and there was an artist signature located on the fourteenth arc. The piece was positioned prominently in the front of the Botanical Garden, and greeted each visitor daily with its bright rings. Due to the extreme impact damage caused by the vehicle, the bolts at the front of the sculpture that secured it to its concrete base were permanently compromised. The three arcs located closest to the street were structurally damaged beyond repair, and the rest of the arcs exhibited scratches, paint losses, surface damages, and rust throughout. Due to the scale of the piece and complexity of the damage, we began to extensively research the history and construction of the work. We learned that the piece was installed at the garden in 1984 as a gift from the David Belin. Belin commissioned the sculpture in memory of his wife, whose remakably sunny disposition and rainbow "signature" were commermorated by the piece. In time, the sculpture had become a hallmark for the Botanical Garden and the surrounding city. Both the Garden and the public were devastated by the damage the work of art sustained. As our research continued, we learned that the work was originally fabricated by Vector Custom Fabricating in Chicago, IL. We were also relieved to know the Garden still had the original plans and sketches for the construction of the sculpture. We reached out to Vector right away and organized an onsite assessment with a representative from their firm and our conservators. The Garden also explained to us that the sculpture had been previously repainted by Scotty’s Body Shop in Des Moines, and that Methods and Materials in Chicago had completed installation work on some of the Garden’s other oversized sculptures and was familiar with their facility. Wasting no time, we worked with Vector, Methods and Materials, and Scotty’s Body Shop to compile a treatment proposal for the sculpture. As we mapped out how the large-scale project would work, we realized we would need another vendor to house the rings as Scotty’s finished painting them (they were too large to fit in their paint shop all at once, and it didn’t make sense to bring them back to Chicago). Scotty’s recommended US Erectors, a storage facility located just down the street from the Garden. We looked into their security and operation, and after several conversations decided to move forward with using them for the last portion of the project. After receiving the Garden’s approval on our approach, our team joined Methods and Materials at the Garden to conduct the deinstallation using a 40T crane. They then transported the rings and base back to Vector in Chicago, where the salvageable rings would be repaired and the rings deemed losses would be refabricated. After Vector’s portion of the project was finished, Methods and Materials picked up the rings and transported them back to Des Moines, where US Erectors and Scotty’s would work together with The Center to coordinate the execution of the painting. Scotty’s then painted several arcs at a time in their shop, carefully referencing the paint selection and colors approved by the artist. Before each ring could be painted, the arc had to be degreased and decontaminated using a wax and grease remover to prep the surface. The painted areas were then stripped and all visible scratches, paint losses, and areas of surface damage were repaired using fillers and corrosion inhibitors. Each arc was then hand washed using a non-silicone soap and rinse, then blow-dried using high pressure air. Finally, two to three coats of paint were sprayed on each arc, followed by two coats of Graffiti-resistant clearcoat gloss. Once all the rings were painted, Methods and Materials picked up the rings from US Erectors and joined The Center's conservators and Scotty's Body Shop at the Garden to reinstall the sculpture on April 25, just in time for its bright arcs to join the Garden’s blooming spring flowers. "Iconic sculpture returns to Des Moines today"
"Sculpture to return to Botanical Gardens this week"
"After more than a year, iconic rainbow sculpture reinstalled"
"Botanical Garden's rainbow sculpture returns after being hit by drunk driver"